^ Will Bagley (June 15, 2000). "Birthday News: News Celebrates Sesquicentennial". The Salt Lake Tribune. ^ William Richards (June 15, 1850). "Prospectus". Deseret News. Retrieved January 31, 2013. ^ Don Woodward (January 26, 1995). "Crossroads Information Network". Deseret News. Retrieved January 16, 2013. ^ Lisa Riley Roche (September 27, 1995). 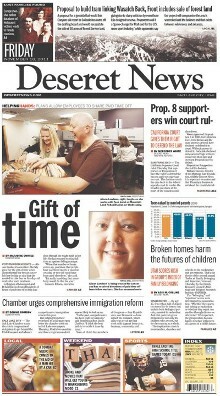 "Deseret News Web Edition". Deseret News. Retrieved January 16, 2013. ^ "Mormontimes.com Site Info". Alexa Internet. Retrieved August 2, 2012. ^ Foy, Paul (March 30, 2009). "Bucking trends, Utah's Mormon newspaper sees gains". Deseret News. Retrieved August 7, 2013. ^ The Salt Lake Tribune (April 30, 2013). "Utah Local News - Salt Lake City News, Sports, Archive - The Salt Lake Tribune". Sltrib.com. Retrieved August 7, 2013. ^ King, Michelle (December 28, 2011). "Michelle King: A new perspective for the new year on Mormon Times TV". Deseret News. Retrieved August 6, 2013. ^ "names Joseph Walker as faith section editor". Deseret News. August 2, 2011. Retrieved August 6, 2013. ^ Dennis Romboy (April 30, 2013). "a top 25 digital newspaper, has Utah's largest Sunday circulation". Deseret News. Retrieved August 8, 2013. ^ Joseph A. Cannon (January 10, 2008). "The Gospel in Words: Mormon Times: New section every Thursday to bring more LDS news, info". Deseret News. Retrieved August 8, 2013. ^ Trent Toone (November 12, 2011). "Michelle King returns to broadcasting as new host of 'Mormon Times TV' show". Deseret News. Retrieved August 6, 2013. ^ "Mormon Times on TV". Mormon Times. October 1, 2010. Retrieved November 9, 2010. "21 editors, publishers in paper's 147 years". Deseret News. May 18, 1997. Retrieved November 15, 2013. Ellen Fagg (June 15, 1990). "Devoted publishers, editors have upheld vision of News". Deseret News. Retrieved November 15, 2013. ^ Orson F. Whitney (1904). "John Nichnolson". History of Utah: Volume 4: Biographical. Salt Lake City, Utah: George Q. Cannon & Sons Co. p. 339. Retrieved November 15, 2013. ^ Andrew Jenson (1901). "Lambert, George Cannon". Latter-day Saint Biographical Encyclopedia, Vol. 1. Salt Lake City, Utah: The Andrew Jenson History Co. p. 613. Retrieved November 15, 2013. ^ "Deseret News manager moves to senior editor". Deseret News. Retrieved November 14, 2013. ^ a b c Paul Beebe (December 20, 2011). "Deseret News appoints new editor, publisher after 16 month vacancy". Salt Lake Tribune. Retrieved November 14, 2013. ^ Kirkpatrick, David D. (December 20, 2009). "The Conservative-Christian Big Thinker". The New York Times.